On the Saturday of my daughter’s birthday, we decided to do a restaurant crawl by foot in the city of New Orleans with the intention of tasting a few appetizers from each restaurant. At John Besh’s Italian restaurant Domenica in the Roosevelt Hotel, the pizza, beer, and wines by the glass are half price from 3 to 6 every afternoon. The pizza is really good here, made with a thin crust and meat toppings made in-house. Word is that they spent over a million dollars importing their pizza oven from Italy. Unfortunately, the place was booked, and the bar was full. This called for plan B. We headed to another John Besh restaurant, Luke, that had their own promotion. From 3 to 6, featured cocktails, wine by the glass, beer, and most of the appetizer menu is half price. What a bargain! We ordered the charcuterie plate with drinks. Lindsay and her husband, Chas, had their first Sazerac cocktail. Were not big fans, but now they know the taste of a Sazerac. There were different pates, pickled veggies, hog head cheese, mustards, breads, and meats on the board, which we all devoured. 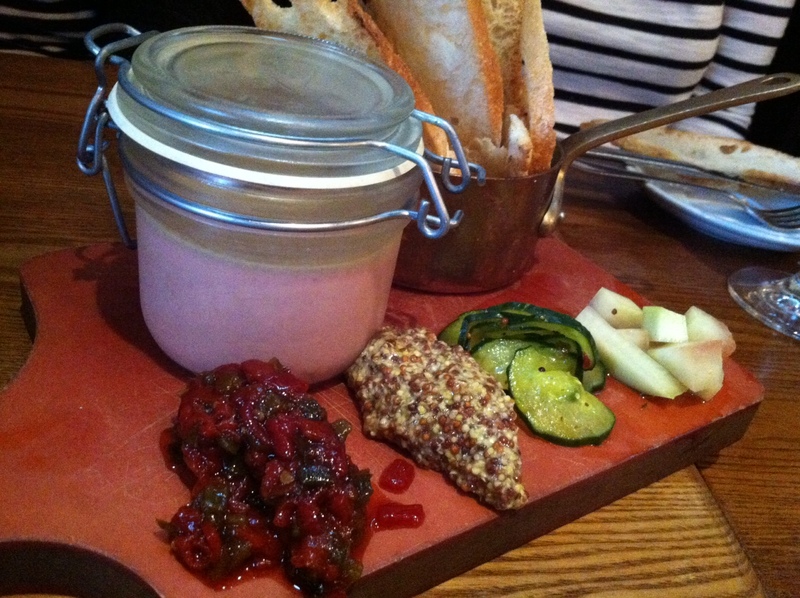 The rabbit pate terrine was definitely the crowd favorite. 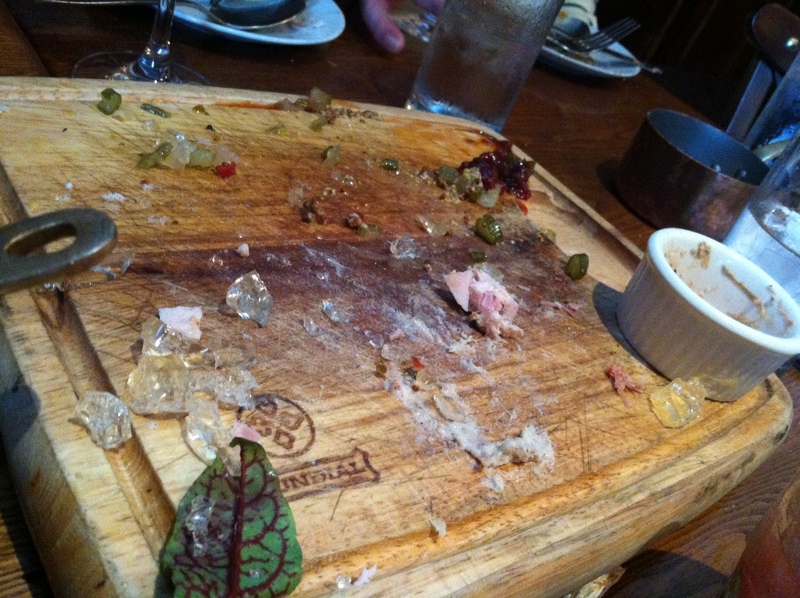 It was so good that we ordered another individual terrine. Very addictive! From Luke we walked to the restaurant Root. What a cool-looking restaurant. You don’t see green chairs too o ften in restaurants. 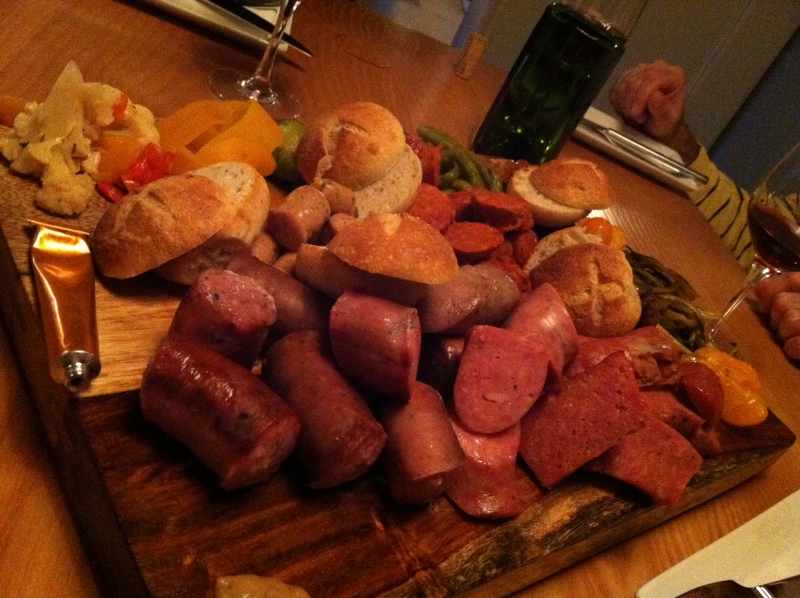 We had the sausage platter. Talk about a sausage extravaganza! There were at least eight different types of sausage, along with different pickled veggies and condiments including pumpkin mustard. The merquez lamb sausage was the favorite. We had a nice Spanish wine, Juan Gil Silver Label 2010, which complimented the sausages nicely. After Root, we took a break and went to the hotel to drink a little wine. Later we went to Geisha for some sushi. Then we ended the night with coffee and beignets at Cafe du Monde. Needless to say, we didn’t go to bed hungry. Birthday girl was very happy. End of story.